For commercial facilities, request an ACCA Manual N, and for home businesses request a Manual J, evaluation of your facility's heating and cooling loads before purchasing any major heating or cooling system. By following these guidelines you will receive a system that is sized appropriately for your facility. 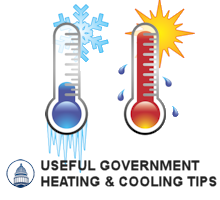 Consider implementing efforts to reduce heating and cooling load before selecting equipment. NEVER OVERSIZE! Avoid over sizing equipment at all costs. Over sizing equipment increases the capital cost at the time of the installation and the costs of operation of the equipment. Request that your HVAC professional conduct an Air Conditioning Contractors of America's (ACCA) Manual N Commercial Load Calculation to ensure proper sizing. When selecting a new cooling system, have your HVAC professional provide you a quote and specifications for a standard-efficiency and high-efficiency unit including lifecycle costs. If the lifecycle cost is less on the high-efficiency unit, purchase it. When purchasing Room Air Conditioners or Light Commercial heating and cooling units, select those units that are ENERGY STAR qualified. In humid climates, consult your HVAC professional about supplemental dehumidification. By controlling humidity at your facility, you can increase occupant comfort and allow for further downsizing of equipment. Consider specifying economizers. Often available at a low incremental cost, these units draw in fresh air from the outside when the temperature outside is lower than the temperature inside. Install programmable thermostats and use automated settings to achieve savings. At a minimum, specify National Electrical Manufacturers Association (NEMA)premium motors on HVAC equipment, and consider specifying variable speed drives (VSD) on condenser and evaporator fans. In dry climates, consider evaporative coolers. These coolers use the evaporation of water to cool spaces, eliminating the need for energy intensive compressors. For facilities that have heat-generating processes such as cooking, or onsite distributed generation equipment, consider heat recovery as a way to capture free waste heat and use it to offset facility heating and cooling costs. For areas such as warehouses and garages, consider installing radiant heating. Radiant heating warms objects instead of the air, and requires less fuel. Radiant heat is also useful for warming exterior areas that require heating, such as patios and waiting areas. Many buildings are impacted by what goes on inside the building just as much as (and sometimes even more than) the weather conditions outside. That is why it is important to properly size equipment and consider the use of a demand controlled ventilation system coupled with economizers to meet the internal loads of the building, e.g., commercial kitchens, computer data centers, etc.